Kaya Wan is one of the most interesting shrines in Zelda Breath of the Wild. It is not hidden at all, and there are only three small rooms to overcome in order to reach the Spirit Orb. Before you head in, be sure to bring at least three arrows. It is not a must, but will help a lot. 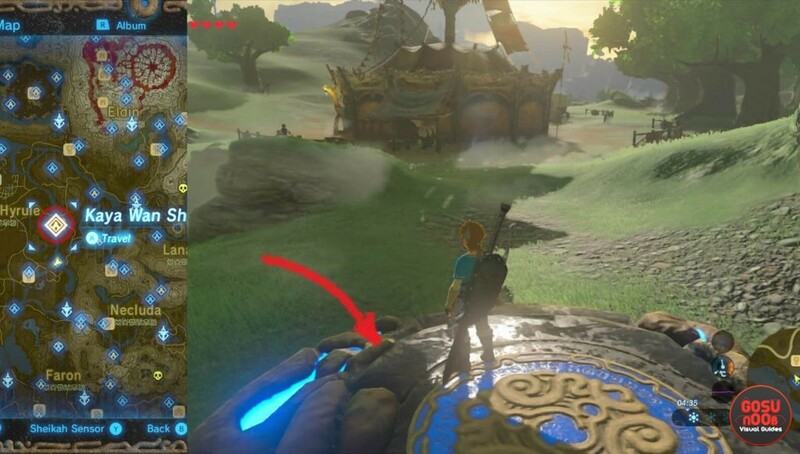 In this guide, we’re going to show you where to find Zelda BotW Kaya Wan shrine, how to get to the treasure chests inside and how to finish Shields from Water challenge. Note: If you’re looking for another shrine, we’ve done a complete Zelda shrine locations map guide. Kaya Wan Shrine is found in western Central Hyrule, close to the bridge that leads to the Wetland Stable. Once you find the stable, you’ll spot the shrine behind it. This is one of those shrines that do not hide at all, but have a decent challenge inside. Cryonis is your main rune here. This rune can also create blocks of ice on the waterfall. This is necessary in order to climb to the top of the first room. Once inside the next room, deal with the small guardian by blocking its fire with Cryonis, or just shooting him with an arrow. There is a treasure chest in the water here. If you create a block of ice underneath the chest, it will raise it from the water. You’ll just have to climb on it and loot the Ancient Core found inside. Ancient Core items are important for upgrading runes and for buying the ancient armor, weapons and ammo.Pick it up and continue to the next room. Use Cryonis rune to reach the next room. With a help of the ice, we get the prize. Just like that, we came from the first to the last shrine room. There is a fast stream of water here, with a two small guardians. Trying to get them down without using arrows can be painful. At the start of the same room, take a look to your left. There, you should spot a gate. In order to bring it up, you’ll need to place Cryonis ice underneath it. It will raise the gate, allowing you to reach the hidden room with the treasure chest and Knight’s Broadsword (26 damage). Make your way to the end of the water stream and the start of the waterfall. Glide towards the Spirit Orb platform and complete the Kaya Wan shrine.